Free up outlet space with a charger that does two jobs at once. Dual USB ports detect connected mobile devices like smartphones and tablets and provide the optimal charge, while the LED nightlight is controlled with just a touch—tap to turn on and off and adjust brightness. It’s an easy add-on to light up unfamiliar places, like when you travel. Dimensions: 2.66" x 1.56" x 1.38"
Combination device is illuminated and has the charger provision. Find the light, find the charger. Too easy. 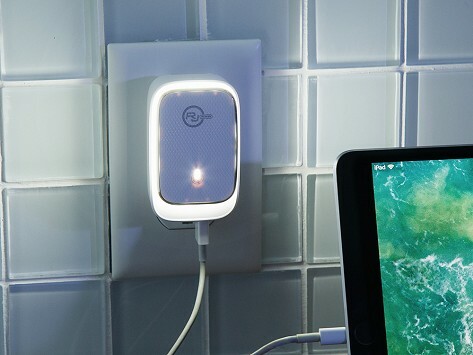 Two bedside essentials are combined into one for this USB charger with nightlight from RevJams—but this handy solution works just as well in common areas like the kitchen and when traveling, too. The LED nightlight is touch-sensitive, so just a tap turns it on and off and adjusts the brightness. It has a smart memory function that remembers the last light setting you used. Dual USB ports automatically detect the smartphone, tablet, or other mobile devices connected to them and deliver the optimal charging voltage. The scaled-down design has foldable prongs for easier portability and has built-in protections against overcharging or overheating. It’s a smart solution that streamlines two functions and frees up always-valuable outlet space.